If you're getting tired of using numerous whitening products from the market, the new Za True White Ex is here to change your mind! This amazing new Za True White Ex series is coming your way to bring you a high whitening effect with minimum items all made to work just right for all the busy ladies! Not only is it fast-acting, the Za True White Ex is gentle on your skin too. The Za True White Ex consists of six products - True White Ex Cleansing Foam, True White Ex Toner, True White Ex Essence Lotion, True White Ex Day Cream, True White Ex Night Cream and True White Ex Exfoliating Clay. The all-new Za True White Ex series is so easy to use - such simple steps that are more than enough to create a bright shine emerging from the center of your face! Feel the 'True White Sheen' on your face as this series is packed with a full range of moisture protection to bring you clear, fair, soft and smooth skin. 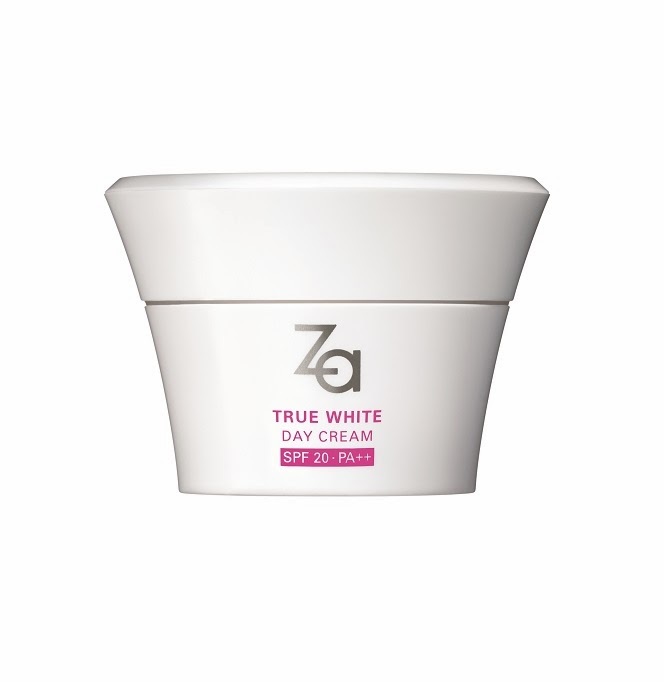 Za True White series include both whitening-target ingredients and moisturizing-target ingredients. True White Ex targets to clear dark spots, blemishes and acne marks through its blend of active whitening ingredients - Whitening 4MSK and highly moisturizing spa ingredients to give you soft, smooth and transparent white skin. The whitening-target ingredients are formulated with Whitening 4MSK and two derivatives of Vitamin C (APM, VC-IP). Whitening 4MSK is an effective whitening ingredient exclusively developed by Shiseido over 13 years. It can inhibit the generation of melanin, accelerate the elimination of melanin out from the skin, even out skin tone and remove marks of dark spots. Together with the 4MSK, the derivatives from the Vitamin C, APM and VC-IP deoxidize melanin and accelerate its elimination, restoring clear and bright skin. The moisturizing-target ingredients contain spa ingredients such as Natural Spring Water from the Cazzaro Mountain (Tuscany, Italy), Aquainpool, Glycerol, TMG, Trehalose, and White Lily. These ingredients are known to bring you an extraordinary whitening experience which puts no stress on the skin, just like having a whitening facial spa every day! Besides its floral green fragrance of Tea Rose, blended with the lovely fragrance of Jasmine and the fresh smell of Lilac will surely make your stressful day a better one! The Za True White Ex Cleansing Foam is a type of cleansing foam that acts gently and removes the dead corneal cells that contain melanin from your skin surface with its rich lather. It gives a cushioning effect to your skin and leads to a brighter, clearer skin, and this cleansing foam is the first step in using the Za True White Ex Range. Coming in a 150ml bottle, the Za True White Ex Toner is the next step in using the Za True White Ex range. This whitening toner is a moist type lotion that keeps your skin looking translucent and hydrated. The Za True White Ex Toner gives clarity to the skin, leaving a refreshing sensation after each use. Keep your skin moist while protecting yourself against the harmful UV rays during the day. With a smooth after-feel, you'll no longer feel the 'heaviness' on your skin - feel fresh and comfortable all-day long! Allow Za True White Ex to work for you while you indulge in your beauty sleep! Use this whitening cream before you hit the sack and wake up to a more moisturized and translucent skin the day after. Its lightweight finishing works effectively and provides comfort. The Za True White Ex Exfoliating Clay clogs dullness-causing dirt that clogs pores and also effectively removes dead keratin cells that contains melanin. Use the Za True White Ex Exfoliating Clay once or twice a week to unveil a brand-new translucent and bright skin. The star of the Za True White Ex series is the Za True White Ex Essence Lotion. Formulated with the Triple Whitening Ingredients which contains 4MSK, APM and Vitamin C essence (VC-IP), the thick liquid hydrates the skin to give you more translucent skin! This single lotion promises pronounced whitening and moisturizing effects without the needs of additional essence or emulsion. This lotion is a new type of gel-like lotion that is luxuriously formulated with whitening essence encapsulated within fine granular particles. Besides the whitening and moisturizing ingredients, the Za True White Ex Essence Lotion contains Hydrolytic Pearl Protein extract derived from conchiolin, a substance that exists in the layer of Pinctada Fucata (Akoya Pearl Oysters). It is known to demonstrate high effect on anti-aging, skin texture refining and whitening and has been widely used in traditional Chinese medicine. It has also been served as a delicacy or as precious medicine, amulet, antidote, and cosmetics. March 2014 at leading pharmacy chains, supermarkets and hypermarkets nationwide. Za is targeted to meet the beauty needs to women who enjoy a forward-looking lifestyle. They are discerning cosmetic users who continuously search for products with a unique image and an original concept. Za carries a complete range of skincare and makeup to help women achieve and maintain a healthy and radiant complexion.